CHICAGO--(BUSINESS WIRE)-- Hyatt Hotels Corporation (NYSE: H) and LATAM Hotels Corp announce the opening of Hyatt Place Tegucigalpa, the first Hyatt Place hotel in Honduras located in the capital city of Tegucigalpa. The hotel brings the Hyatt Place brand’s intuitive design, casual atmosphere, and practical amenities, such as free Wi-Fi and 24-hour food offerings, to the Central American country. Hyatt Place Tegucigalpa is the first of five Hyatt Place hotels that are set to open in Central America over the next three years under the relationship with the hotel owners LATAM Hotels Corp. Upcoming Hyatt Place hotel openings include locations in Managua, Nicaragua; Guatemala City, Guatemala; San Salvador, El Salvador; and a second hotel in Honduras in San Pedro Sula. Currently, Hyatt Place hotels in Latin America and the Caribbean are located in Costa Rica, Panama, Mexico, Chile, and Puerto Rico. Located in the financial center of the city at Paseo Los Proceres, the 126-room Hyatt Place Tegucigalpa is central to all of Tegucigalpa’s main attractions. The neighborhood is home to exclusive gated residential communities, the Novacentro shopping mall and the Embassy of the United States, among others. A number of other entertainment and business hubs are nearby, including restaurants, bars, cinemas, banks, and shopping centers. The hotel is less than five miles from Toncontin International Airport. As the first Hyatt Place hotel in Honduras, the hotel commissioned a special artwork from renowned Honduran artist Santos Arzu Quioto. The result is an abstract work defined by the artist as “Cartography of Tegucigalpa,” and it reflects the colors and textures of the city of Tegucigalpa or “Cerro de la Plata” (Silver Mountain) as described in Spanish. The artwork hangs as the focal piece in the hotel’s Gallery area. 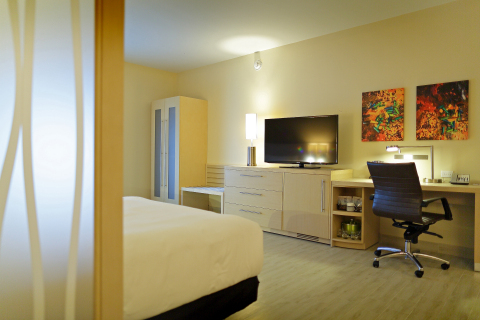 Hyatt Place Tegucigalpa is part of Hyatt’s loyalty program, Hyatt Gold Passport. Guests can earn Hyatt Gold Passport points and redeem for free night awards without blackout dates and more at more 600 Hyatt locations worldwide. GHL HOTELS is an international hotel chain with more than 50 years of experience and the largest expansion in Latin America. It is an operator and developer with presence in Colombia, Ecuador, Peru, Chile, Argentina, Panama, Curacao, Costa Rica and Honduras. Its current portfolio is formed by 70 operations of Hotels, Suites and Convention Centers. The high conception that it feels for the noble exercise of hospitality, commits them to find excellence in service, providing appropriate solutions (Accommodation, Food and Beverages, Communication, Recreation and other solutions) for the needs of its guests.